2014 S5. Is a start/stop button normal? 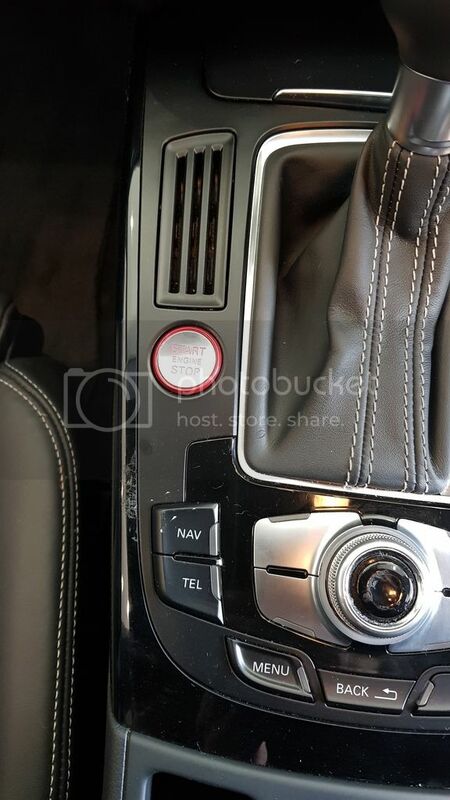 Looking at swapping my A4 for a 2014 S5 and I have found one I like but it has a start/stop button, this is the only S5 I have seen it on. Has this car already been fiddled with? Help as always much appreciated. It has a mystery lump in the boot that I've not seen in other cars. Thank you for that. As this is a 2014 car then somebody has clearly retro fitted this. Is it a known MOD? Easy to do? I ask incase it is not and there is a fair chance it's a proper botched job. Advanced key has always been an option on the B8 since 2009. 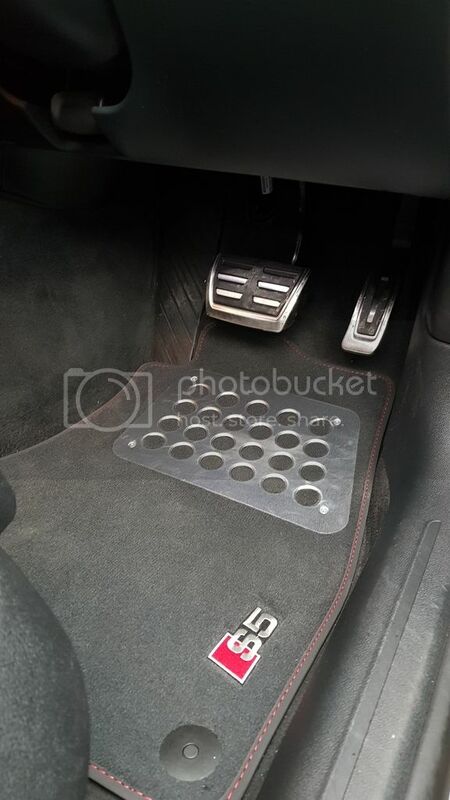 The lump in the boot is for the control unit for the sports-diff. It is only present on the sportsback (I don't know why). Sports diff was also an option and is quite rare. So it might be a legitimate button and not a retro fit then. About the sports diff, how can I easily tell if it has this option? Assuming I can't get easy access to all the build codes in the service book is there anything quick I can look for to see if the sport diff is present? If I can get the codes can somebody point me in the direction of a website that will decode them for me. 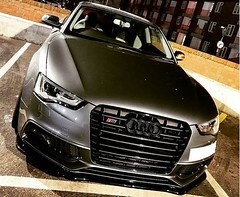 Does anybody have a link to the options list available for a 2014 S5? Hay, just a fore note on the start stop button, they are easier to steal with fool devices, when i called around to insure my s5, a handful of the insurers asked me if it had keyless start or not, one elaborated and said their brokers may not be keen to cover such cars. Thankfully mine doesn't have a button maybe call prospective insurers first to see what affect it has on premium/cover. Should be easy to spot.. not sure how subtle I can be looking for it though. And who has a car that clean underneath! With regards the start/stop button, the car still has the key slot next to steering wheel is this normal for keyless entry? Regards insurance, thanks for the heads up I will definitely look into this before I commit to the purchase and if I do I'll get the RFID pouch bag blocker things to store the keys in. Some cars have Start button but not keyless entry as standard. If you find the build sticker in the front of the service book or rear of the car on the boot floor somewhere it’ll give you all the option codes it has, you can then go online to decode it. I think it does have. AND... a strange camera looking thing in the rear view mirror mount. Can anybody tell me what it does? If you have B&O it will be written on all the speakers. Sorry, meant to say the speakers do have B&O on them but the advert for car just says Audi Concert, I wondered if the concert had B&O speakers. The camera thing is for main beam assist. It dips your mains beams when there is a vehicle approaching . Keep telling yourself that not having the options is a good thing. How do you know it doesn’t have the sports diff? 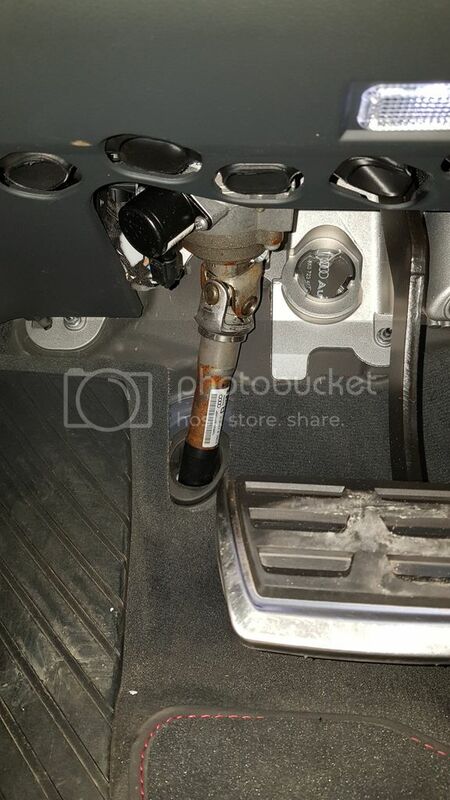 The boot protrusion is a very odd thing to have been retrofitted. I layed on the floor and looked under the car very subtle like. It definitely didn't have it, any other reason it would have the bulge? Is anything else needed for the lane assist? Wondering if it can just be activated if I have the camera? Run the VIN through a VIN decode website and you will then know all the options that the car came out of the factory with. It’s not lane assist it’s main beam assist. Lane assist has a camera above the rear view mirror attached directly to the windscreen. It’s very unlikely you’d would have he main beam assist sensor in your mirror without you actually having main beam assist. There is more to it than just the hardware. You need the wiring and the coding. Go in to your car systems menu and then set individual. If there’s a setting to change the sport diff then you have a sport diff. FYI sport diff is a significant and rare option. Advanced key is great and I wouldn’t be without it but it’s not rare on the same way. I now have the build sheet from Audi, a nice man in Perth printed it for me but it is 5 pages of codes for standard and the optional equipment... Including the codes for what packaging the car left the factory with. The descriptions that accompany the codes is not clear. I've picked a few out that I think are the options can somebody in the know confirm. I can't see anything on the sheets for hill hold assist yet it has the extra button below the hand brake switch. Anybody know the code? I can't see anything in the list that needs the camera thing in the rear view mirror. Any help is welcome, I thought it would be easier to tell what the added options were but it's not so clear what Extras the car has. Still. It's an S5 and I can't what till Thursday. Copy of the 5 pages of codes if anybody can put into English what options I have. Might be easier then going through my last post. Ok, so you’ve got some great options there. 1N8 - dynamic steering £1000 option configured by ADS (drive select) - another option. You do have spirt diff too - a fantastic option and very rare. £600 option. Certain enthusiasts will hunt down cars just for this option. Advanced key - can’t live without it, don’t listen to the increased premium scare stories, all my cars have had it - never been asked. If concerned, fit an auto watch ghost. Code for hill hold assist is 1HT I think. Can I ask what the age mileage and price you paid for this car is? I just bought a similar spec one and am interested. pm if you prefer. Thanks all for help. Looks like I got a right bargain if the specs hold water when I collect on Thursday. The codes are BS. Mine has 0G7 = tiptronic and I have nothing about sports diff (or any diff for that matter) in my list. When I was looking at used S5 sportsbacks there were some with the bulge and some without. It was my understanding that those with have sports diff. My S5 has sports diff and the bulge. The best way to confirm it is in the ADS part of the MMI. I'm kind of hoping it goes a bit like this. PR codes don't say you have it then you still might. PR code says you do.... Then you do. What I don't want is to find out is you have the boot bulge..
PR codes say you do... But you don't. I'll find out for sure on Thursday. To be fair even if it has none of these toys I still got a great car at a very good price. If it has the toys then I robbed the dealer blind, they really had no idea what they were selling. 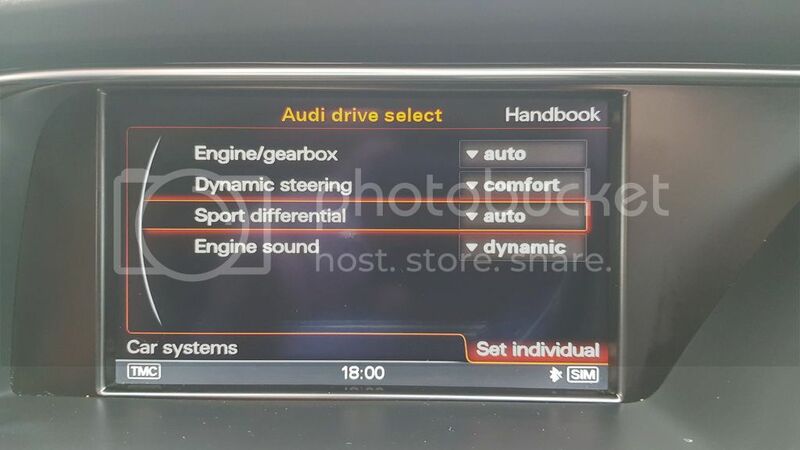 I have a 2015 S4 saloon; it has sports diff, and the option code on the car's data sheet is GH2. It has hill-hold assist, and the code is UH2. @MuPPeT_ON_TouR , fingers crossed that today you find the car has eveything you want. And here are pictures from my S4 boot. It seems there are sufficient differences between the architecture of the saloon and sportback/coupe variants that the saloon doesn’t need a hump. Keyless entry and the sports diff and the steering thing. Coming out of a 3.0tdi A4 I was apprehensive that it wouldntw be enough for me. The 3.0 TDI was plenty of power and I loved it. The soundtrack alone in my S5 I know I'm never going to get bored. Looking forward to many more posts on this forum. Thanks for everybody's input and help. 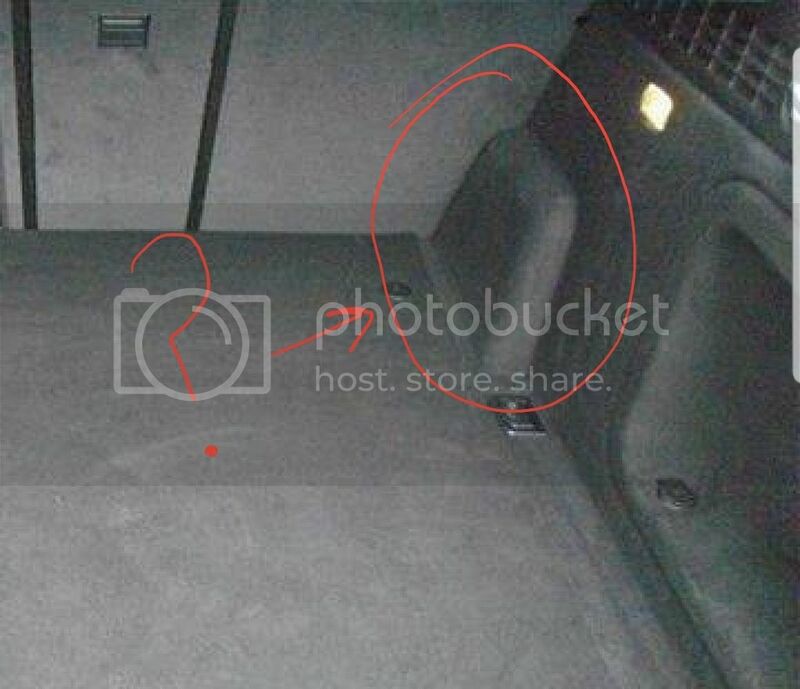 Can you take a picture in your driver footwell of the bottom of the steering column. I’d like to see if you have true dynamic steering. Admittedly your build sheet says 1N8 so I’m certain you do. Mine looks a bit rusty.